Originally from picturesque St. Albans, Vermont, Chef Heather Terhune first discovered her passion for cooking while canning vegetables and making preserves under the watchful eyes of her mother and grandmother. Terhune’s family first noticed her culinary interest at the age of four when she asked for artichokes and spare ribs as a birthday present. Food has been on her mind ever since. Enjoying the natural bounty of Vermont was a way of life for the Terhune family, who hunted, fished, gardened, tapped trees for maple syrup and even raised pigs. Despite spending most of her childhood in New England, Terhune considers herself a proud Midwesterner. Her family moved to Missouri during her teenage years, and Terhune graduated from the University of Missouri (Columbia) with a Bachelor of Science in agriculture and hotel/restaurant management in 1993. With a desire to further her culinary education, Terhune returned to the East Coast in 1993 to attend the New England Culinary Institute, from which she graduated in 1995. This experience provided her with a foundation of classic French cooking, which inspired Terhune to pursue her first professional cooking position at The Willard Room in Washington D.C.’s venerable Willard Hotel. Terhune continued to hone her craft, later joining the team at The Watergate Hotel’s famed Jean Louis restaurant, where she worked under three-star rated Michelin chef Jean Louis Palladin until his retirement. During her time at Jean Louis, Terhune developed a true sense for her French technique as well as a love for butchering and appreciation for simple, seasoned food. 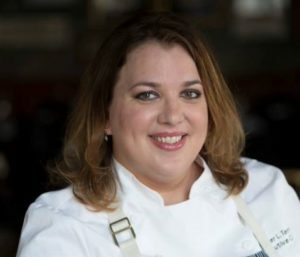 Following the closure of Jean Louis in 1996, Terhune moved to Durham, North Carolina to work at Pops Trattoria as sous chef, in addition to pastry chef, a role she considers to be her first culinary passion. In 1997, Terhune felt the itch to move to a big city and later headed to Chicago to become the pastry chef at 312, before taking on her first executive chef position with the opening team of Atwood in 1999. After spending a decade mastering her skills on American comfort food at this beloved Loop mainstay, Terhune moved to Sable Kitchen & Bar at Kimpton’s Hotel Palomar in downtown Chicago. As executive chef at Sable, she created a menu of both innovative and approachable dishes that highlighted the quality of local ingredients. With the opening of Tre Rivali and The Outsider, Terhune returned to the Midwest to launch Kimpton’s first restaurants in Milwaukee after recently serving as the executive chef of BDK Restaurant & Bar in San Francisco. Within her role, Terhune enjoys exploring Wisconsin’s farms and cooking with the bounty of ingredients available in the area. At Tre Rivali, Terhune’s menu features Mediterranean-inspired modern American cuisine made with local ingredients inspired by her travels abroad and the soulful cooking of her Midwestern upbringing. In her free time, Terhune enjoys the local restaurant scene, traveling, baking, reading and practicing yoga.